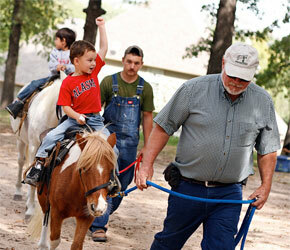 Pony Park is located at the front of our facility and overlooks scenic Mill Creek Pond. Pony Park includes a covered picnic table with lots of room to run and play. Bring your party supplies and enjoy Pony Park for a total of three hours, which includes lead line pony rides with one pony for one hour. A three-hour party in Pony Park is $175. You may add an additional pony for an extra $75 or rent the park with no ponies for $125. A $50 deposit is also required to reserve your party. This deposit is non-refundable, unless cancellation is due to inclement weather. To inqure about pony parties or to schedule a party, please contact us or call 918.299.9283.